The APPSC has conducted the Group-I prelims examination on 27th May 2012 and announced the list of eligible candidates qualified for the Mains Exam. Subsequently as per orders of Hon’ble APAT, the key was published and there were objections to this key. After verification of all objections received the final answer key was published on 2nd Sep 2012. 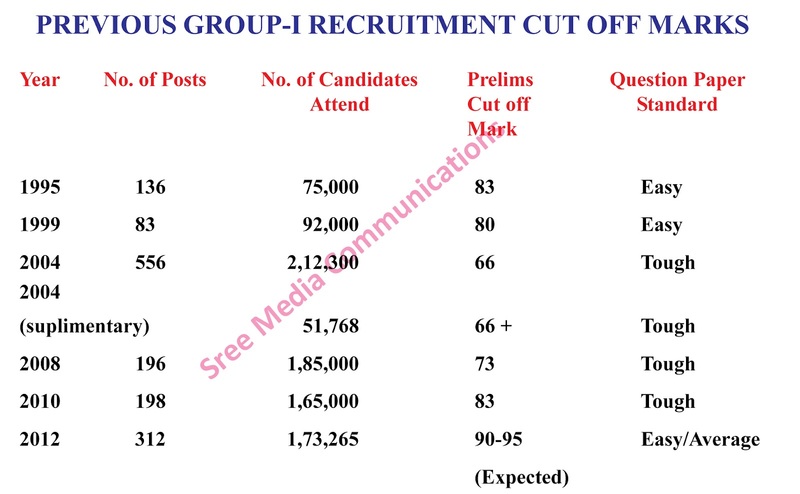 As per this key the Cut off mark is 91 and total of 845 candidates are proposed to be deleted from the list of eligible candidates announced earlier as they failed to secure the cut off marks as per the final answer key. Q.Nos. 6,8,10,69 & 104 Cancelled. Five marks added to each candidate. Q.No. 17 having two answers (1&2) as per Commn's Orders in C.No. 298/CD/2012, dated: 13/06/2012. Q.Nos. 14,36,38,40 & 99 Cancelled. Five marks added to each candidate. Q.No. 47 having two answers (1&2) as per Commn's Orders in C.No. 298/CD/2012, dated: 13/06/2012. Q.Nos. 9,74,126,128 & 130 Cancelled. Five marks added to each candidate. Q.No. 137 having two answers (1&2) as per Commn's Orders in C.No. 298/CD/2012,dated:13/06/2012. Q.Nos. 39,96,98,100 & 134 Cancelled. Five marks added to each candidate. Q.No. 107 having two answers (1&2) as per Commn's Orders in C.No. 298/CD/2012, dated:13/0/2012. 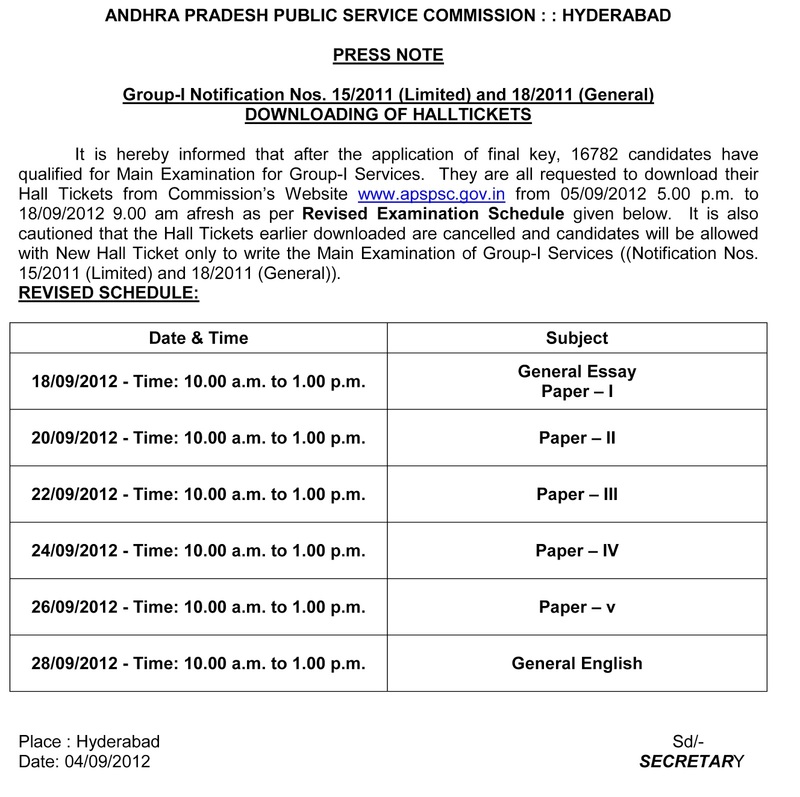 The Screening test held on 27/05/2012 (Sunday) from 10-30 AM to 1-00 PM for the posts falling under Group-I Services which were notified in Notification No.15/2011 (Limited) and 18/2011 (General), the candidates whose Register Numbers are given have provisionally qualified for appearing to the Main Examination which will be held from 3rd September 2012 at 5 centres Viz. Hyderabad, Visakahpatnam, Vijayawada, Tirupathi and Warangal only. 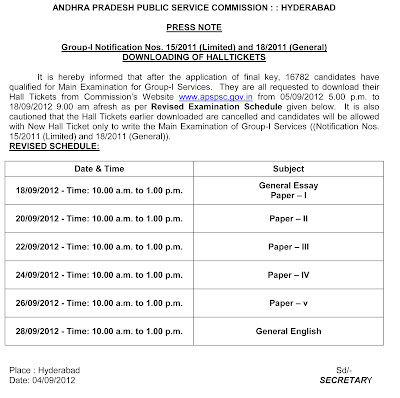 Andhra pradesh public service commission (APPSC) conducted Group-1 preliminary examination on 27/05/2012. Total 1,73,265 candidates attend for this exam. 72.50% attend the preliminary exam. This is only a screening test which means these marks are considered only to select candidates to main exam in the ratio of 1:50. As there is 312 posts, generally 15,600 aspirants are going to permitted to take main exam. There is no reservation or quota in selecting candidates for main exam from preliminary examination. As per the experts opinion question Paper is relatively easy or average. The cutoff marks estimation vary from expert to expert. Generally it is expected to between 90 to 95 marks. 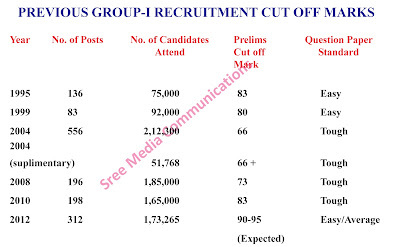 Those candidates who got more than 95 (+/- 5) marks they may Start preparation for Group-I main exams. Analyze: To find out what something is made up of by identifying its components. Critically Analyze: To find out critically what something is made up of by identifying its components. Assess: To examine something, to determine something in order to judge or evaluate it. Critically Assess: Assessment containing or involving comments and opinions that analyze or judge something, especially in a detailed way. Bring out the Significance: Bring out the implied or intended meaning. Capture the Movement: To seize or gain control over a fast changing. Comment: An implied or indirect judgment. Consider: To think carefully about something. Debate: To talk about something at length and in detail, especially as part of a formal exchange of opinion. Describe: To give an account of something by giving details of its characteristics. Do you agree? Give examples: To have the same opinion about something as somebody else. Decorate with examples. Discuss: To write or speak about the topic formally/officially. Elaborate: To organize with thoroughness and careful attention to detail. Elucidate: To explain and clarify something. Evaluate: To consider or examine something in order to judge its value. Examine: To study or investigate something. Critically Examine: Critically study or investigate something. Examine closely: To study or investigate something carefully or thoroughly. Explain: To give reason for something that has happened, often as justification for it. To justify. Formulate: To draw something up carefully and in detail. Give Argument in favor of something: To give reason to support your argument. Give your judgment in favor: To form sound opinions and make sensible decisions or reliable guesses. Investigate: To take a look and see what has happened. List out the Salient Features: Arrange the noticeable and striking distinctive features. Highlight the Salient Features: Take out the best part. 2. Which country has not the common border with India? 5. Which one of these not a principal tributary of the river Brahmaputra in India? 6. Which river of Daccan region not flowing eastward? 7. Which is the correct sequence of the rivers flowing in southern peninsular India in context of length? 8. 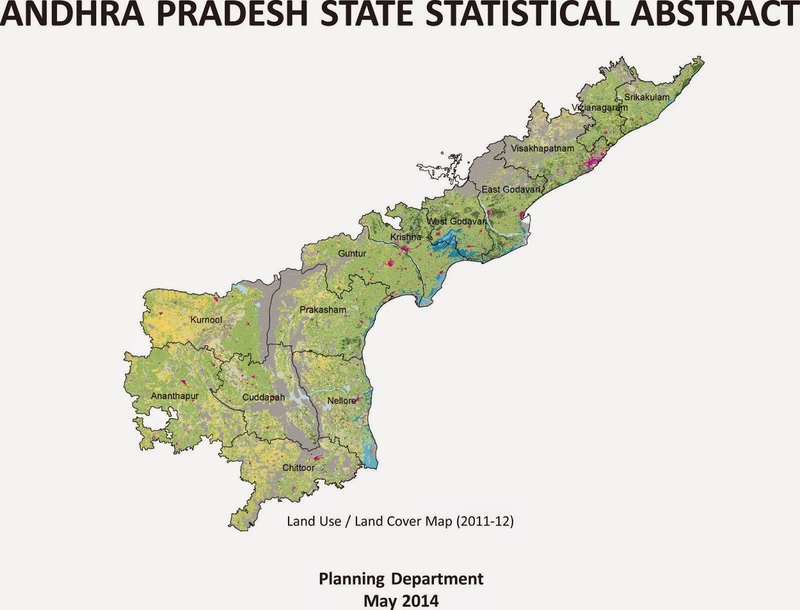 Botanical Survey of India (BSI) is situated in which city of India? 9. What is the number of spokes in wheel of Ashoka Chakra placed in the National Flag? 12. When was the constitutional Assembly adopted the National Anthem? (c) 24 January, 1949 (d) 26 January, 1949. 17. At present, what is the number of members in Rajya Sabha? 18. In order to be chosen a member of parliament, what is the lower age limit? 19.Which one is not a standing committee of the parliament? 20.Which department is not under the Ministry of Home Affairs? 22. On which day the civil services day celebrated every year in India? 23. A committee of parliament on official languages was constituted in which year? 24.Which statement is not true about Inter-state Council? (a) The inter-state council is a recommendatory body. (b) It was constituted in year 1990 under Article 263 of Indian constitution. (c) Prime Minister is the chairman of the interstate council. 1. Election Commission of India is a permanent constitutional body. 2. The election commission was established on 25 January 1950. 3. The president appoints chief election commissioner and election commissioners. 26. The National Bamboo Mission was launched in 2006-07 as a centrally sponsored scheme to promote the growth of bamboo sector. Which one is not the aim of National Bamboo Mission. (d) Establishment of paper industries. 27. Which one of these are not correct about Micro irrigation? (a) The main objective of this scheme is to increase the coverage of area under improved method of irrigation. (b) Quality production is the main concern of Micro irrigation. (c) During the current year 10 crore has been earmarked for North East region. (d) This is only implemented in western India. 28. Recognizing the importance of institutional support for the development of horticulture in the North East region, the establishment of a central Institute of Horticulture has been approved for implementation in 2005-06. In which state the central Institute of horticulture established. 29. What is the objective of multi state cooperative societies Act 2002? (a) Use of modern tools for more efficient and transparent functioning. (b) Enabling the business growth by providing a conducive environment. (c) Strengthening and expanding the multistate co-operative societies. 31.What is the number of Farmers benefited with Kisan Call centres since start functioning of this programme till December 2010? 32. National e-governance plan in Agriculture is started by which department of centre to improve services accessible to farmers using information and communication technology? 1. Small Farmers Agri-business Consortium (SFAC) was registered by Department of Agriculture and Cooperation on 18th January, 1994. 2. SAFC is managed by the Board of Managing Consisting of 20 members and Chaired by the union minister of agriculture as its ex-officio president. 3. SAFC has established 18 state level SFACS by contributing corpus fund. 35. The National Academy of Dance, Drama and Music named Sangeet Natak Akademi was the first of these entities to be established by a resolution of the Ministry of Education on 31st May 1952. Who was the then Minister of Education in India? 36. ‘Gharana’ and ‘Sampradaya’ is related to which field of life in india? 39.Which one is not the followship of Sahitya Academy? 42. The National Mission for Manuscripts was launched by the Government in 2003. Which is the nodal agency of the National Mission for Manuscripts. 45.Which one of the following is not correctly matched? 47. The National Sample Survey (NSS) was set up in 1950; when was this organization reorganized? 48.Where is the headquarter of survey Design and Research Division, which is one of the division of the National Sample Survey (NSS)? 49. In which year the first Economic Census came into existence? 1. India is the founder member of the universal postal union (UPU) since 1876. 2. India is the member of Asia-pacific postal union (APPU) since 1964. 3. India exchanges mail with more than 217 countries by air and surface. 52. The Forest Conservation Division implements the forest (conservation) Act. When was that Act enacted by the parliament of India? 54.What is the number of National Parks in India? 55.When the scheme ‘Development of National Parks and Sanctuaries’ has been modified as integrated Development Habitats. 56.Wildlife Institute of India (WII) is an autonomous institution under the administrative control of the Ministry of Forest & Environment. When ‘WWI’ was established? 57. Zoos in India are regulated as per the provision of the wild life (protection) Act. When this act came in existence? 58.When was the centrally sponsored scheme ‘Project Tiger’ launched? 59.What is the number of tigers in India shown after the counting of tigers in 2011. 61. India has a Memorandum of understanding with which country on controlling transboundary illegal trade in wild life and conservation? 62.When was the project Elephant launched? 63.Which statement/statements is/are true about project Elephant? 1. All India estimation of elephant is done every five years. 2. The total number of Elephant Reserve in country has become 27. 3. The project Elephant is being implemented in 13 states of India. 64. In August 1980, where the GB Pant Institute of Himalayan Environment and Development (GBPIHED) was established? 65.Which one of these statements are not true about Forestry Research in India? (a) Indian Council of Forestry Research and Education (ICFRE) is an apex body in the national Forestry research system. (b) This council promotes the solution based Forestry Research. (c) The council enhances public confidence in the ability of forest managers and researches to successfully handle challenges to natural resource management. (d) The council has only one research institute in New Delhi. 66. Defence Research and Development Organization (DRDO) is the Research and development wing of the Department of which Ministry under government of India? 68.Which one of these are not a goal of Sarva Shiksha Abhiyan (SSA)? (a) Enrolment of all children in school. (b) Retention of all children till the upper primary stage. (c) Bridging of gender and social category gap in enrolment, retention and learning. (d) Enrich the high class of Higher education. 69.What was the annual outlay for the Sarva Shiksha Abhiyan (SSA) in the year 2010-11? 70.Which one of these statements are not true about Kasturba Gandhi Balika Vidyalaya Scheme? (a) It provides the residential selting for upper primary school for girls. (b) The scheme provides for a minimum reservation of 75% seats for girls from SC, ST and OBC. (c) It provides 25% reservation to girls from families below the poverty line. (d) There is the ratio of boys and girls student is 50:50 in Kasturba Gandhi Balika Vidyalaya Scheme. 71. National programme of Nutritional support to primary education now knonw as MID DAY MEAL SCHEME was first introduced in which year in India? 72.When was the name of National Programme of Nutritional Support to primary education changed as ‘National Programme of Mid Day Meal in School’? 73. The National Ball Bhawan is an autonomous organization fully funded by the Ministry of Human Resources Development. When was the National Bal Bhawan established? 74. The scheme which identify creative children within the age group of 5 to 16 years in creative art, creative performance, creative scientific innovations and creative writing? 75.When the National Council for Teacher Education (NCTE) was established? 76. The Right to Education provides free and compulsory education of all children in the age group of 6 to 14 years. This right inserted age group of 6 to 14 years. This right inserted to which article of the constitution? 78.When was the National population education project was launched? 80. Which Article of the constitution states that “The state shall promote, with special care the education and economic interests of the weaker sections of the people and in particular of the scheduled castes and scheduled tribes and shall protect them from social injustice and all forms of social exploitation”? 81. IGNOU has established a network of open and Distance Learning institutes and centres in the region. At present, what is the number of regional centres of IGNOU? 82. The commission for Scientific and Technical Terminology prepares and publishes definition dictionaries and Terminology in various discipline in Hindi and in other languages. Where is the Headquarter of The Commission for Scientific and Technical Terminology? 83. The University Grant Commission (UGC) is a statutory organization for coordination, determination and maintenance of standards of university education. When the UGC was established? 84.Which statement is not true? (a) India is a member of World Intellectual Property Organisation (WIPO) since 1976. (b) World Intellectual Property Organisation (WIPO) is a special agency of the United Nationls which deals with copy right and other intellectual property rights. (c) National Book Trust was established in 1959. (d) NBT organizes the Work Bank Fair in New Delhi every year. 86. The National Thermal Power Corporation Ltd. A Navratna Company of the Government of India.When the NTPC was incorporated? 2. REC is a public financial institution, which is responsible to financing rural electrification schemes. 3. REC is the Nodal agency for implementation of ‘Rajeev Gandhi Grameen Vidhutikaran Yojana’. 89.Where is the Corporate Centre of National Power Training Institute (NPTI) situated? 91. India is a member of International Energy Forum (IEF). Where is the permanent secretariat of IEF situated? 92.When the Government of India was approved the New Exploration Licencing Policy (NELP)? 93.Which one of these, not a public sector petroleum company? 94. Pitambar Pane National Environment Fellowship is given every year to encourage and recognize excellence in any branch of research related to environmental Science. In which year this fellowship instituted? 95. ‘Medini Puraskar’ is given to encourage writing of original books in Hindi on which subject? (c) 5 August (d) 5 October. 98. Senior citizen of 65 years of age or above are eligible for old age pension under NOAPS, but not getting pension covered under which scheme? 100.Which country is not included in India’s ‘Look East Policy”? and small enterprises. When this scheme was launched? 102.Where is the National Institute of Miners health (NIMH) situated? 106. The National Test House is a government laboratory of national importance in the field of testing and evaluation of material and products of all engineering branches except food. Where is the headquarter of the National Test House? 107. The NTH has its six regional laboratories in India. In which city of India NTH has no regional laboratory? 110. In which year the National Health Policy was regular to achieving an acceptable standard of Health-for the general population of the country? (c) 12 April, 2008 (d) 12 April, 2009. 114. Rashtriya Aragya Nidhi was set up in which year to provide financial assistance to patients? 115. The National Academy of Medical Sciences (NAMS) was established in 1961 as a nonofficial body of Bio-medical Scientists. Where is the National Academy of Medical Science situated? 1. Jawaharlal Nehru National Urban Renewal Mission (JNNURM) launched on 3rd December 2005. 2. Basic Services to the urban poor provided in JNNURM. 3. The duration of Mission is for 7 years beginning from the year 2005-06 till 2011-12. (c) 1 and 2 (d) 2 and 3. 117.When a dedicated Indian sports channel of Doordarshan was launched? 121.Which one is not correctly matched? 122. Consider the following statements. 1. The Central Board of Film Certification set up under the cinematograph Act 1952. 2. It consists of a Chairperson and twenty five other non-official members. 3. The Board has its headquarts at Mumbay and nine regional offices. 123. In which city of India there is no regional office of Central Board of Film Certification (CBFC)? 124. The National Film Development Corporation Limited (NFDC) was formed by the Government of India with the primary objective of planning and promoting an organized, efficient integrated development of Indian Film Industry. When was the NFDC was incorporated? 125. The Film Finance Corporation was set up in the year 1964. When was this corporation menged within the National Film Development Corporation Limited (NFDC)? 126.Which statement is not correct? (a) The film institute of India was setup by the Government of India in 1960 under the Ministry of Information and Broadcasting. (b) Films and Television Institute of India provides the latest education and technological experience in the art and technique of film making and television production. (c) Children’s Film Society was established in 1965 to provide value based entertainment to children. (d) The Directorate of Film Festivals was up under the Ministry of Information and Broadcasting in 1973. 128.What was the achieved growth rate of GDP in Ninth Five Year Plan? 129. Three Annual Plans formulated between which years? 130. In which Five Year Plan, the National Rural Health Mission was launched? 131. According to which Article of the constitution, the Gram Sabha is constituted in Panchayati Raj? 132.Which statement is not true about the Mahatma Gandhi National Rural Employment Guarantee Act? (a) The Act came into Force on Feb. 2, 2006. (b) It was implemented in 130 districts is phase two 2007-08. (c) The scheme was extended to the remaining 274 districts of India. (d) In First phase it was introduced in 150 districts. 133. In which year, the Ministry of Rural areas and Employment was renamed as Ministry of Rural Development?